clearly had the wood on him even though the weights heavily favoured him in most of the early clashes. He must have been pretty damned good because Citation is usually rated No 3 by most Americans in the all time best list. Fame attaches to very few and can be fleeting as we all know. For example in 1950 the Daily Racing Form's outstanding horses (published in the American Racing Manual) was confined to 19 horses the most recent being foaled in 1945 but 7 foaled in the decade before publication. The 19 we Salvator (1886) Domino (1891) Sysonby (1902) Colin (1905) Exterminator (1915) Man o'War (1917) Gallant Fox (1927) Equipoise (1928) Seabiscuit (1933) War Admiral (1934) Whirlaway (1938) Alsab (1939) Count Fleet (1940) Stymie (1941 ) Armed (1941) Busher (1942) Gallorette (1942) Assault (1943) and Citation (1945). By 1980 and now called the 20th Century Hall of Fame the number had been reduced to just 14 giving the boot to the 19th century stars Salvator and Domino. The 14 being Sysonby (1902), Colin (1905) Man o'War (1917) Exterminator (1915) Equipoise (1928) Count Fleet (1940), Citation (1945) (only seven survived the cut from 1950) and the seven newbies Tom Fool (1949) Native Dancer (1950) Nashua (1952) Swaps (1952) Kelso (1957) Forego 1970) Secretariat (1970) although only 2 were foaled between 1957 and say 1975 (4YO for 1980 edition of the American Racing Manual published by DRF). So throw out those two Seabiscuit movies. By the time we get to 2005 the list of the great horses of the 20th century has expanded to 27. Of the original 19 from the 1950 edition only five made the 2005 list and they we Colin, Exterminator, Man O'War, Equipoise Count Fleet and Seabiscuit (back in favour so retrieve those movies). I am not suggesting Noor should be there. Rather it helps if you are a hero in living memory which is the point of selecting notable horses that youngsters like us may have overlooked. 18 starts, 17 wins, 1 second, 0 thirds. Win % 94.4, Place % 100.0. * Worldwide earnings are calculated by converting the British pound at the average of Spot Sterling Close for GBP 1.00 to the USD or FRF as published in the (London) Times or (London) Daily Telegraph for the race date or a previous day if the race date is not a trading day. First place prizemoney for each race appears at the end of each race record for which Brigadier Gerard placed first. These amounts are based on figures published in the (London) Times or (London) Daily Telegraph. These newspapers do not publish place prizemoney. I have calculated the second place prizemoney for the Benson and Hedges Gold Cup as being £9,171.85. This figure is 20% of the total prizemoney. I have assumed first prizemoney of £30,955 is 67.5% of the total as published in the (London) Times and Daily Telegraph and is split: 1st 67.5%, 2nd 20% 3rd 10%, 4th 2.5%. My total for all 18 races is about £65.00 higher than the total prizemoney on wikipedia and about £63.00 higher that the amount on pedigreequery. The Biographical Encyclopaedia of British Flat Racing has a total for 17 wins that bears no relationship to any other figure I can find so I can only suggest there was an error in publishing noting that one of the authors of that book was Roger Mortimer who reported for the (London) Times when Brigadier Gerard raced. The (London) Daily Telegraph, Wed 21 June 1972, page 1 reported that the Brigadier had won £110,431 after 13 starts and that equals the total of the individual race prizemoney amounts set out below for the first 13 starts. I could find no information in that paper or the (London) Times of his total earnings after his 18th start. Nothing I have read in the Telegraph or Times newspapers at the time his retirement was announced put him among one of the greats. Perhaps it is the understated British style of reporting (Bruce McAvaney where were you). The discussion seems to have been about him being syndicated to stand at stud in England when the owners might have got more if the owners had tried to syndicate him internationally (which I infer means selling him to the USA). He could win on heavy to good (fast) and over 12f. (2400m.) so I would rate him better than Frankel but behind Ribot. On reading some of the race reports where the ground was officially rated as good one gets the impression that the weather was so bad that the track must have been at least slow. TWO YEARS: 1970 Starts 4: 4-0-0-0 for GBP 13,468.00. THREE YEARS: 1971 Starts 6: 6-0-0-0 for GBP 79,240.00. 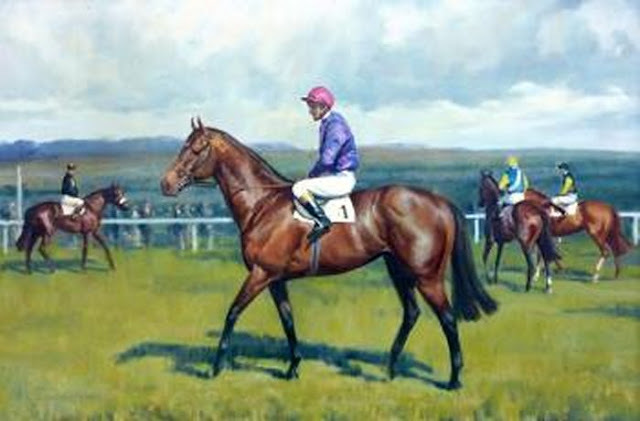 * Brigadier Gerard also broke the old course record in running second. Roberto was ridden by Panamanian American Braulio Baeza who was specifically brought over to ride Roberto. Some thought that the front running style he brought to the race contributed to the Brigadier Gerard's defeat. Newspaper commentary before the race centred on the Brigadier equalling Ribot's winning streak of 16 which I interpret as the benchmark for being one of the all time greats of the modern era. It seems many could not believe Roberto was capable of beating the Brigadier. The Brigadier seemingly redeemed himself at his next start by breaking the course record. The problem with Brigadier Gerard was that he was born the same year as Mill Reef who the Brits did regard as an out and out champion. And both Brigadier Gerard and Mill Reef were the year after Nijinsky. Brigadier Gerard's record is very impressive. Thanks for all the race records, Tim. I'm sure I'm not the only one really enjoying reading about some of the past champions. The problem with Mill Reef is the only time they met, the Brigadier beat him. True. However, with the English fascination with mile and a half racing, most in England would have considered that Mill Reef's Derby and Arc wins put him above the Brigadier. The grading classification was first applied in 1971 to races conducted in Great Britain, Ireland, France and Italy and in 1972 to Germany. For the purposes of the analysis below all races classified as group 1 in 1971 (or 1972 re Germany) were deemed to have been a group 1 race prior to those years. The total number of races in Europe deemed to have been classified as group 1 races plus the total number of actual group 1 races conducted was 8,329 to the end of the 2018 year. All horses that one won five of these races were selected. Added to this number were selected horses that won 0 to 4 in group 1 races in Europe but were thought to have won group/grade races outside Europe after commencing racing in Europe. 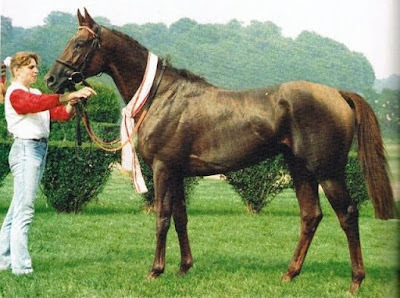 Of these there were four horses that won all their group / grade 1 races outside Europe of which only one, Bald Eagle, competed before the introduction of the pattern system. In total I have so far found there are 128 horses that won 5 or more group 1 races. Of these 50 are deemed to won five or more group 1 races (retrospectively) and 78 won five or more group 1 races under the pattern system. Italian racing has been on the decline since the 1970s and this may affect the number of European group 1 winners (they need another Tesio to lift their profile). The earliest horse to feature was Gladiateur (FR) 1862 followed by Boiard (FR) 1870 and Jongleur (FR) 1874. A surprising omission was Jim and Tonic (FR) 1994 who raced all over the place for 13 wins and set an earnings record for a French bred horse (wikipedia) yet his only group 1 win was the 1999 Hong Kong Cup. All the rest won seven or less. The Canadian representative was Nijinsky II (CAN) 1967. There is very little information on the internet about quite a few of the French bred horses before the pattern racing era. Chasing the detail should keep me busy for years. By way of comparison with Europe 187 Australasian horses have won 5 or more group 1 races of which about 77 raced under the pattern system introduced in 1978/1979 (some raced before and after the change). To paraphrase tontonan perhaps this reflects the institutionalised nature of racing in Australia (and New Zealand). And I have found that in North America just over 170 horses achieved 5 grade 1 wins of which 54 raced before the pattern regime was introduced in the USA (this information is a a few years out of date). How about Rock of Gibraltar? I have him winning 8 successive group 1's. Sobig - thanks re Rock of Gibraltar - I did a quick check of the candidates against their major wins on their wikipedia page and pedigreequery stakes wins. His win in the Breeders Cup was not listed as major win on his wikipedia page although one G3 win was. That win is listed in pedigreequery. Missed that one somehow. 26 starts, 12 wins (7 x G1), 5 seconds, 1 thirds. Win % 46.2, Place % 69.2. 'equibase' has 26 starts for 12-5-1-8 for USD 754,215 which may include at least one other Mondrian; racingpost mixes at least one other Mondrian in its records and DRF only has 3 starts. 'france-galop' and galopp-seiger.de do not have a complete record. german-racing.de has prizemoney for each German start and misses one start in England and is the most complete record. 'pedigreequery has 26 starts for 12-5-1-8 for Euros 965,434 The pedigreequery euro earnings is equal to DEM 1,888,225 if the euro to DEM conversion rate of €1 = 1.95583 DM set on the changeover on 1 January 1999 is used. * Based on Reserve Bank of Australia (rba.gov.au.statistics/…) daily exchange rates as published for the date of the race or the previous trading day if the date falls on a non-trading day. I have included earnings at the end of each race record in the local currency only. So in the 5 starts he had outside of Germany he ran last 3 times, 2nd last once and 3rd last once. Better record than you have in the Soap Box.